Eleven banks in China are enlisted among the top 50 banks in the world by total assets (2015). China hosts some of the best and the biggest banks in the world like the China Construction Bank. The largest banks in the world are measured by their total assets and market capitalization. Assets are anything of value and can be tangible (like computers and office equipment) or intangible (like patents and financial assets). Market capitalization is the total dollar market value of a company’s outstanding shares. This article takes a look at which countries have the most banks from the top 50 based on total assets. China tops the list with a total of 11 of the world’s top 50 biggest banks. Of these 11 banks, 4 of them are the top 4 biggest banks in the world. These are the Industrial and Commercial Bank, China Construction Bank, Agricultural Bank of China, and the Bank of China. All of these banks are state-owned though over the last decade have all made a move toward functioning like their western counterparts. The Industrial and Commercial Bank focuses on foreign exchange business and was once the main supplier of funds to the manufacturing sector. 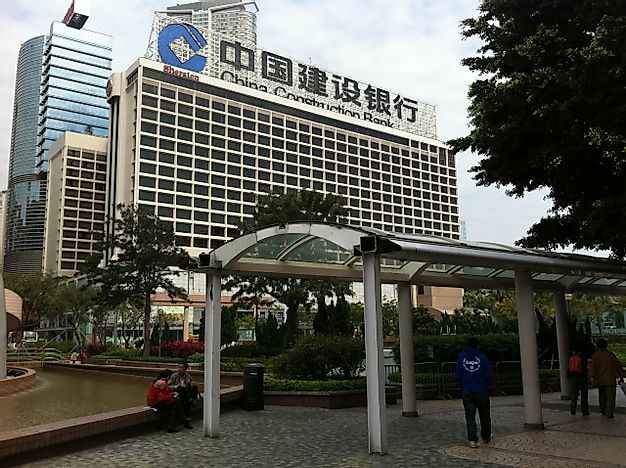 The China Construction Bank specializes in short and long-term loans for infrastructure and urban housing development. With the unprecedented growth in China in recent years, it’s no wonder that this is one of the top banks in the world. As the name suggests, the Agricultural Bank of China provides financing to the agricultural sector including farmers, villages, and rural establishment. The Bank of China conducts mainly foreign-exchange transactions and trade finance. In addition, it is listed on the Hong Kong Stock Exchange. The United States is next on the list with 6 of the 50 biggest banks in the world. The government here has been pushing banks to reduce in size, a move not favored by the shareholders. This push has seen its effect as the biggest banks have dropped in ranking over the last year. The biggest bank in this country is JPMorgan Chase, which holds 7th place in the world. Its services include investment banking, asset management, private wealth management, and treasury and security services. Management at JPMorgan Chase is divided into corporate and private equity, commercial banking, investment banking, and asset management. Banking in this country is regulated by the federal and state governments. France, Japan, and the United Kingdom each have 5 of the top 50 banks. These countries have all lost ranking due to the growth of Chinese banks and losses during the recent financial crisis. In France, the biggest bank specializes in retail banking. The largest bank in Japan, the Mitsubishi UFJ Financial Group, is the second-largest bank holding company in the world. This fact means it controls several banks. It has also invested in a rare earth developing firm in Australia. In the UK, the biggest bank is the HSBC, a multinational banking company. Once the world’s 4th largest bank, it now holds 6th place. The bank provides financial services to small, medium-sized and middle-market companies, global corporate banking, and global private banking with a presence in 71 countries. Other countries on the list include Australia (4), Canada (3), Germany (2), Italy (2), Netherlands (2), Spain (2), and Switzerland (2). Big banks have a huge influence on the global economy because their gross domestic product comprises a large percentage of global economic output. They provide the capital necessary for development investments, government borrowing, and commercial and consumer loans. This global reliance can be a negative thing when the economy begins to decline, and governments decide that banks are “too big to fail.” This fact encourages banks to become involved in normally high -risk transactions that will result in the other party paying for the consequences of any failures.